Artistic talent fascinates me. Especially whimsical, quirky, artistic talent. My mother-in-law emailed me some pictures of chalk art today, drawn on plain, boring old sidewalks, just like the ones you and I walk on. 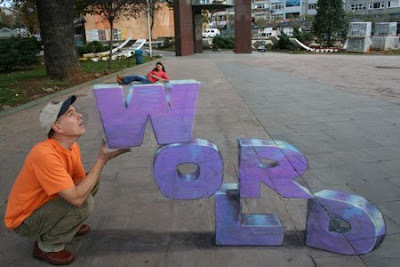 As far as I know, there is no trick photography involved, but the artist uses perspective to trick your mind. The guy standing at the top of the "tower" is actually standing on the sidewalk. The tower and the hole are drawn with chalk. The fellow holding the "w" is near the camera, and the lady that looks like she's laying on top of the "w" is actually laying on the sidewalk farther down by the tree. 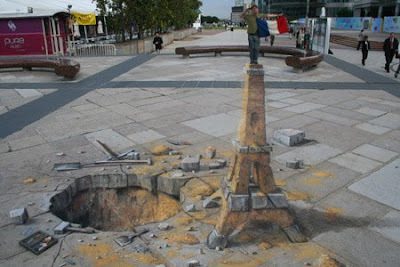 You can see more of Julian Beever's stuff here. All I can say is it must be heartbreaking when a thundercloud rolls up. 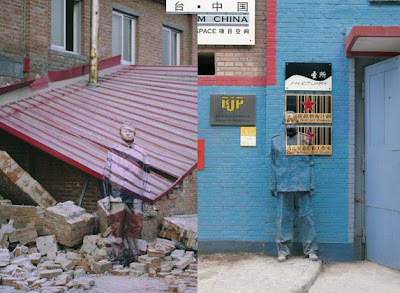 Another guy that caught my attention was Liu Bolin, a political activist from China. He paints his body to blend in with his surroundings, and is known as "The Invisible Man." Again, just boring old paint like you and I might use, but applied by a strangely talented mind. 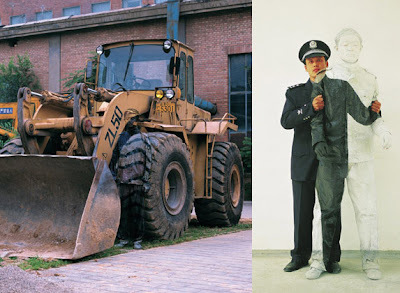 My October 13 post talks about out-of-the-box thinking, and gives links to more of Liu Bolin's artwork. If it weren't for out-of-the-box thinkers, we'd still be using carrier pigeons to deliver messages. 124 years ago today, Alexander Graham Bell transmitted the first message ever over a telephone line. It seems simple enough now, but only a crackpot could be the first one to figure out how to send a voice through a wire. Bell is a household word (I'm glad he wasn't named Zdunczyk), and every school kid knows he invented the telephone, but you might not have known about his photophone, which transmitted sound on a beam of light. Wireless communications using a beam of light . . . that takes some serious eccentricity to conjure up. We take fibre optics for granted, but Alexander Nutcracker Bell was the forerunner. Although firefighters aren't famous innovators, significant advances have been made in the past hundred years that make our job easier and safer. I'm not Edison or Bell, but that doesn't stop me from dreaming up harebrained ideas. You may have read some of them in my October article for Fire and EMS Quarterly. If not, click here. If only there was such a machine. We'd be the best cared for service out there.